One of the perks of being a MadCap Software user is having access to a large community of skilled and enthusiastic fellow users who are happy to share their knowledge and expertise. We’ve always encouraged our users to connect with each other, and now it’s easier than ever to tap into this valuable resource. Visit our new Community Page to learn more about the following ways to join the vast network of MadCap Software users. A great place to start connecting with other users is online. With topics ranging from Importing to Styles to Source Control and everything in between, the Official MadCap Software Forums are where to go for product-specific tips, answers to your burning questions, and fresh ideas to help you with your projects. You’ll also find a vibrant and active MadCap user community on LinkedIn. 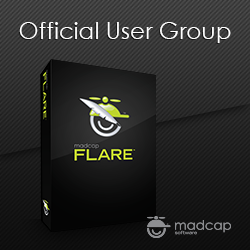 The Users of MadCap Flare group was founded in 2008 and boasts the largest collection of Flare users on LinkedIn. The MadCap UK & Europe Users Group was launched this year by some members of the ISTC, but the group is open to everyone. Joining a local Flare User group gives you the opportunity to meet in person with users in your area so you can share knowledge and experience and strengthen your skills in MadCap Flare. User Groups are forming all over the world and you can find one to join here. If a User Group hasn’t been established near you, start your own! Nita Beck, manager of the Rochester Flare User Group (the very first Flare User Group) offers her advice in this webinar: Calling All Propeller Heads: How to Start Your Own Flare User Group. Some MadCap Flare users share their knowledge and experience on personal blogs. Tom Tregner’s Flare For Programmers blog focuses on programming, scripting, and automating with Madcap Flare projects and outputs. Laura Johnson shares helpful tips and tricks on her blog, A Flare for Help. Nita Beck also shares some great techniques on her blog at the Beck Communications website. Kai’s Tech Writing Blog is maintained by Kai Weber, who posts about Flare and other subjects of interest to Technical Communicators. The MadCap Community is a resource that continues to grow and evolve, so we’ve created a hub to access all of its different facets. Bookmark this page and visit often to connect with MadCap users all over the world.